MONDAY, Oct. 1, 2018 (HealthDay News) -- Deep space travel has been shown to harm astronauts' eyes, muscles, hearts and immune systems. Now, new animal research suggests that venturing beyond Earth's protective atmosphere could also damage their gastrointestinal tracts. "We have documented the effects of deep space radiation on some vital organs, but we believe that similar damage responses may occur in many organs," explained senior investigator Dr. Kamal Datta. He is a project leader of the NASA Specialized Center of Research (NSCOR) at Georgetown University Medical Center in Washington, D.C.
"It is important to understand these effects in advance so we can do everything we can to protect our future space travelers," Datta said in a Georgetown news release. 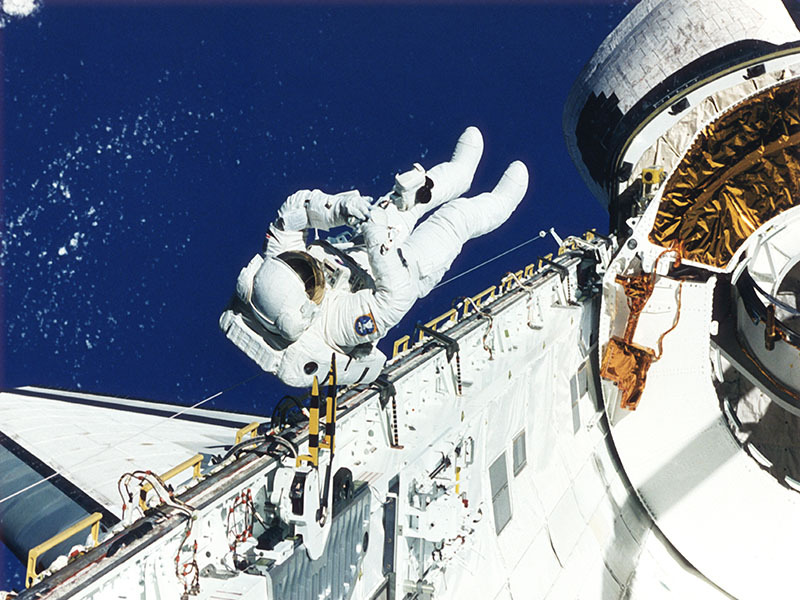 In the study, Datta's team exposed mice to a low dose of iron radiation at the NASA Space Radiation Laboratory (NSRL) in Brookhaven National Laboratory in New York. The mice received a very low dose over the equivalent of a months-long stay in deep space. The rodents were then examined at Georgetown. "Heavy ions such as iron and silicon are damaging because of their greater mass compared to no-mass photons such as X-rays and gamma rays prevalent on Earth," Datta said. "They generate oxidative stress and inflammatory molecules that induce more damage. This greatly affected migration of cells that are needed to replace the intestinal lining, which slowed down GI functioning," said Datta, who is also a member of Georgetown Lombardi Comprehensive Cancer Center. The effects of the iron radiation appeared to be permanent, the study showed, though research on animals frequently doesn't lead to the same results in humans. "With the current shielding technology, it is difficult to protect astronauts from the adverse effects of heavy ion radiation. Although there may be a way to use medicines to counter these effects, no such agent has been developed yet," Datta said. "While short trips, like the times astronauts traveled to the moon, may not expose them to this level of damage, the real concern is lasting injury from a long trip such as [to] Mars or other deep space missions, which would be much longer," he added.